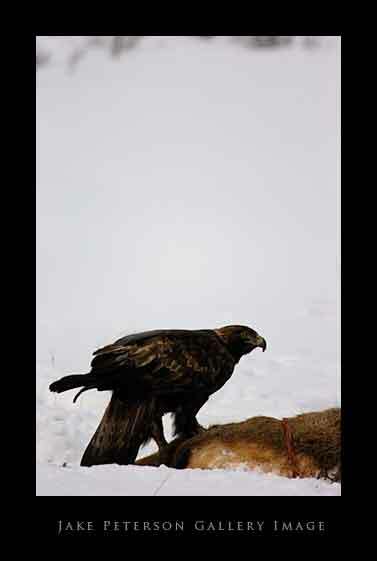 This is quite a normal scene, a bird of prey on a carcass by the side of the road. I was driving up the road heading towards Bozeman away from West Yellowstone, when I saw a carcass of an Elk. Can’t say if it were male or female because the antlers were gone, the head was covered in snow and its back was toward me. There was a coyote on the grounds as well but he was a little more skittish. The Eagle seemed to have control of the feast. Of course the local ravens and magpies were all over the place but as I said the eagle was the boss.